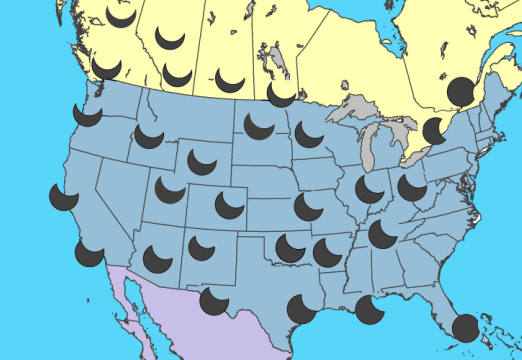 Last Thursday (23 Oct 2014), North America was treated to a partial solar eclipse. This occurs when the moon passes between the Earth and Sun, casting its shadow onto part of our planet. 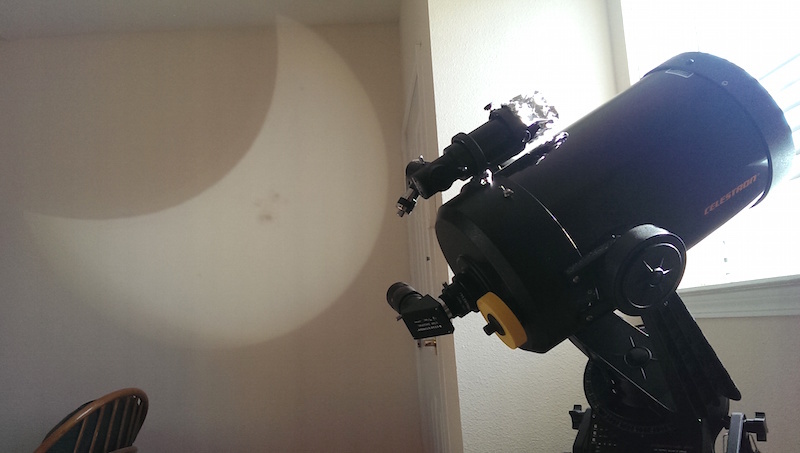 For observers in the California Bay Area, the moon blocked about 40% of the sun. Partial eclipses are fairly common (2-5 times a year, somewhere on the Earth), but they can still be quite interesting to observe. 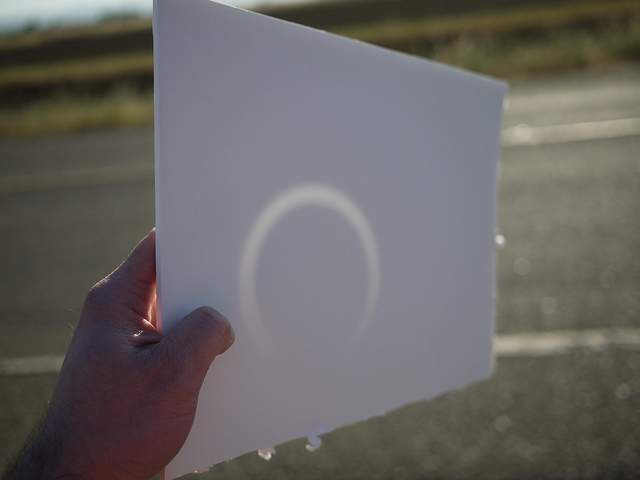 The first two eclipses I recall observing were on 11 July 1991 and 10 May 1994. The exact dates are not memorable; they’re just easy to look up as the last eclipses to pass through places I lived ! 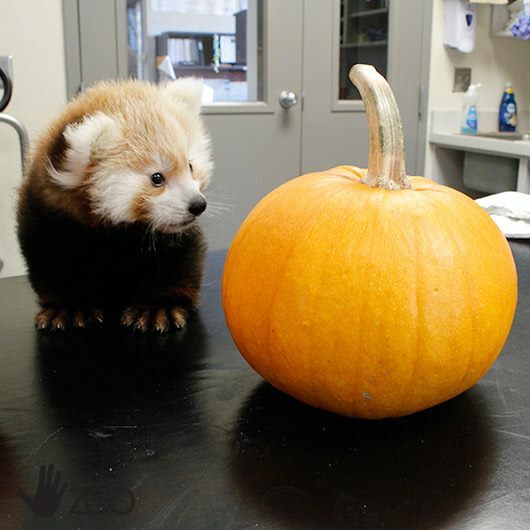 But I do remember trying to observe them with some lackluster-but-easily-available methods of the time. 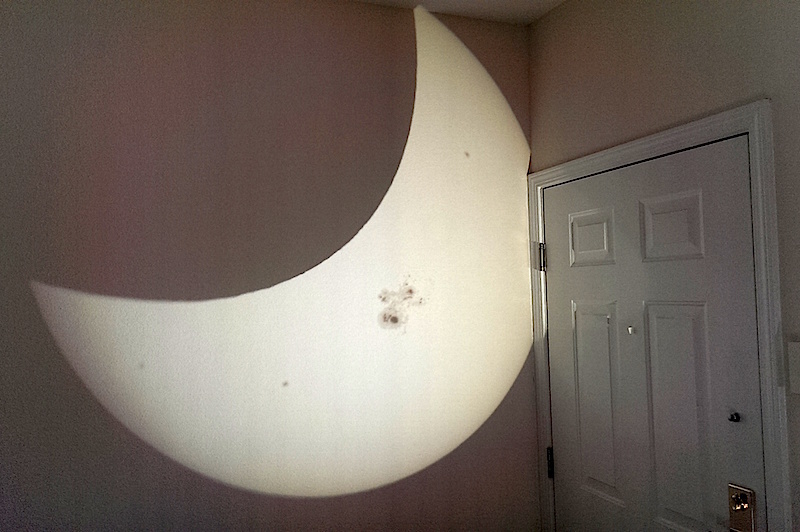 Pinhole projection seems to be most commonly suggested, but I never got good results from it. Using a commercial audio CD (which uses a thin aluminum coating) had worked a bit better for me, but this is highly variable and can be unsafe. 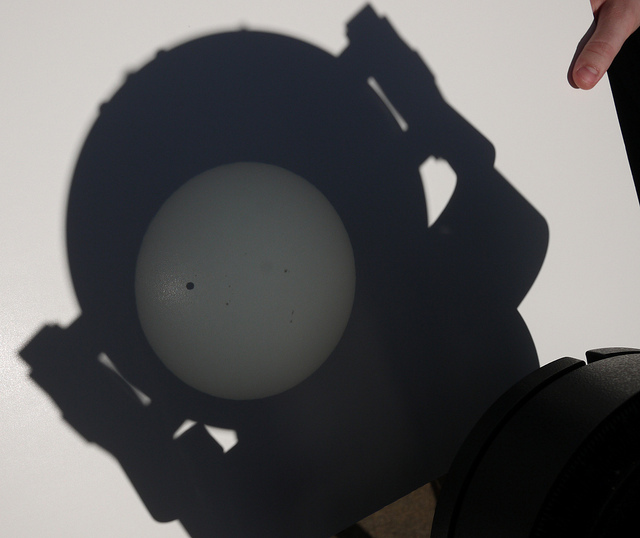 For the transit of Venus a few days later — a very rare event that occurs only once ever 105 years — I switched to using my telescope for even better quality. You don’t look through it, but instead use it to project a bright image of the sun onto another surface for viewing. 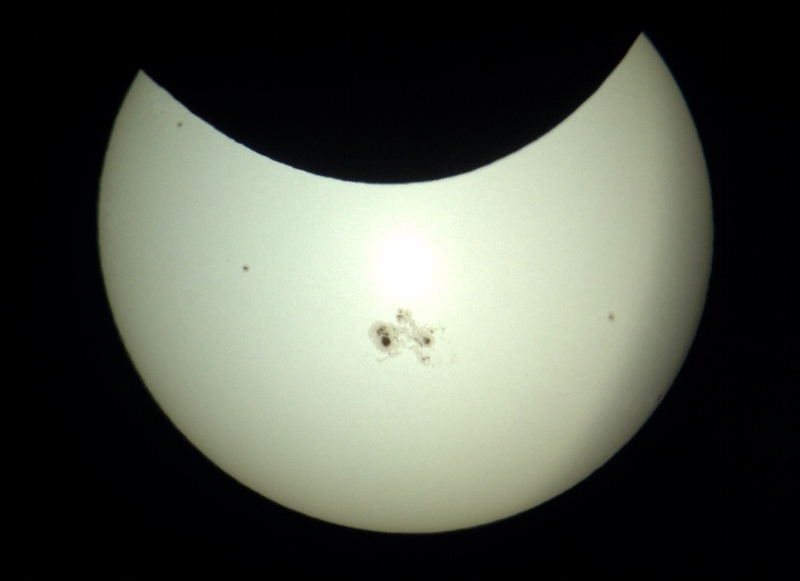 I was excited to catch last week’s eclipse because there was an unusually large sunspot (“AR2192”) that was going to be visible. It’s one of the larger sunspots of the last century, so it seemed like a bit of an historic opportunity to catch it. 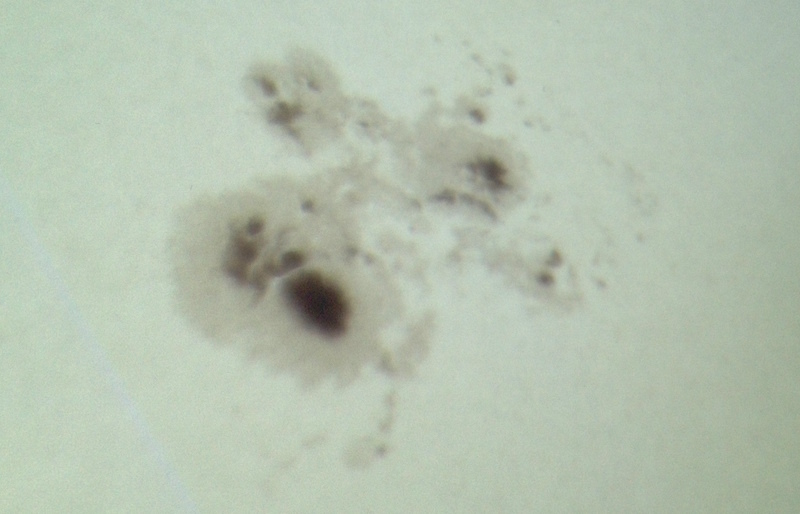 The image was obviously quite large, and made it easy to examine details of the large sunspot AR2192, as well as a number of smaller sunspots that were present. 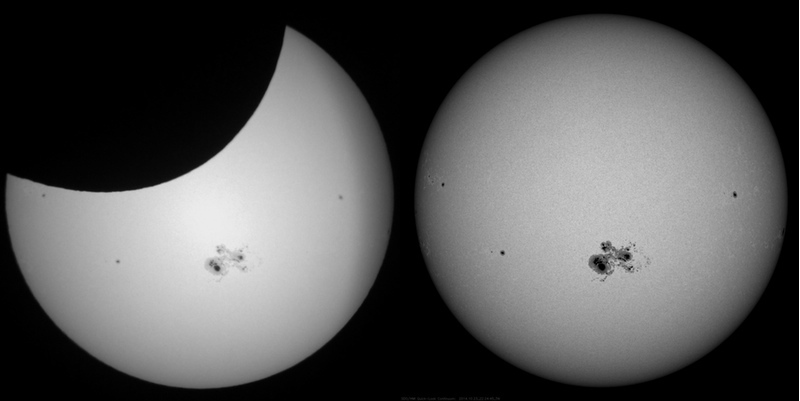 As with the transit of Venus, it’s fun to compare my picture with that from NASA’s $850-million Solar Dynamics Observatory. Observing this sunspot wasn’t nearly as exciting as the Carrington Event of 1859, but it was still a beautiful sight to behold. I’m definitely looking forward to the 21 August 2017 eclipse, which should be a fantastic total eclipse visible from a wide swath of the US! I upgraded to a new MacBook about a week ago, and thought I’d use the opportunity to try living without Flash for a while. I had previously done this two years ago (for my last laptop upgrade), and I lasted about a week before breaking down and installing it. In part because I ran into too many sites that needed Flash, but the main reason was that the adoption and experience of HTML5 video wasn’t great. In particular, the HTML5 mode on YouTube was awful — videos often stalled or froze. (I suspect that was an issue on YouTube’s end, but the exact cause didn’t really matter.) So now that the Web has had a few additional years to shift away from Flash, I wanted to see if the experience was any better. The short answer is that I’m pleased (with a few caveats). The most common Flash usage for me had been the major video sites (YouTube and Vimeo), and they now have HTML5 video support that’s good. YouTube previously had issues where they still required the use of Flash for some popular videos (for ads? ), but either they stopped or AdBlock avoids the problem. I was previously using Flash in click-to-play mode, which I found tedious. On the whole, the experience is better now — instead of clicking a permission prompt, I find myself just happy to not be bothered at all. Most of the random Flash-only videos I encountered (generally news sites) were not worth the time anyway, and on the rare occasion I do want to see one it’s easy to find an equivalent on YouTube. I’m also pleased to have run across very few Flash-only sites this time around. I suspect we can thank the rise of mobile (thanks iPad!) for helping push that shift. There are a few problem sites, though, which so far I’m just living with. Ironically, the first site I needed Flash for was our own Air Mozilla. We originally tried HTML5, but streaming at scale is (was?) a hard problem, so we needed a solution that worked. Which meant Flash. It’s unfortunate, but that’s Mozilla pragmatism. In the meantime, I just cheat and use Chrome (!) which comes with a private copy of Flash. Facebook (and specifically the videos people post/share) were the next big thing I noticed, but… I can honestly live without that too. Sorry if I didn’t watch your recent funny video. I will readily admit that my Web usage is probably atypical. I’ve rarely play online Flash games, which are probably close to video usage. And I’m willing to put up with at least a little bit of pain to avoid Flash, which isn’t something fair to expect of most users. But so far, so good!